For starters, an explanation for the very long space inbetween blog posts recently- I've been quite literally rushed off my high heel clad feet (only around the house of course- what better way to do homework than when you're in a fifties tea dresses and huge cardigans?) in the past two weeks. Christmas is looming its festive head, and the pressure of making presents and typing up tedious essays and end of term assignments has grabbed all my time.. But I'm back, for at least today! And hopefully once the holidays start then there'll be lots more blogging to be done. 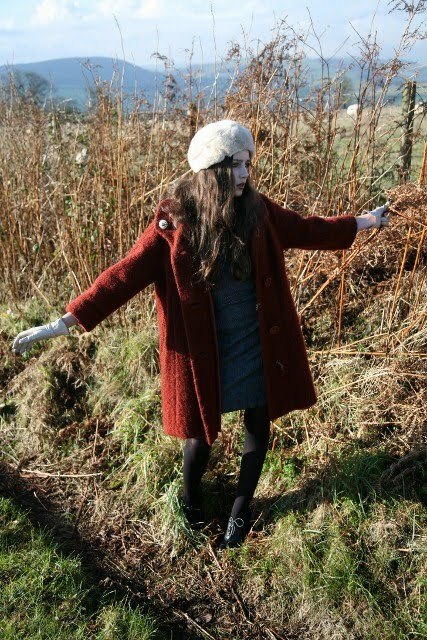 Last weekend I found this great faux fur hat in one of my favourite charity shops, which gave me the perfect justification to lug around two big coats and some heels on a family walk in the hills... This is a spot that has been frequented by us many times over the years, and what I love about it is how one minute you are following a path in the middle of nowhere and the next you are confronted by a TV mast towering on the crown of a hill. What a great contrast. The vintage black coat was bought at a flea market stall, and is the only real winter coat I am willing to wear all the time for actual warmth. The trapeze shape is beautiful and I love the detailing of the wool. The matching hat was given to me by my paternal Grandmother. Who doesn't love a floppy hat? The brooch was also hers. 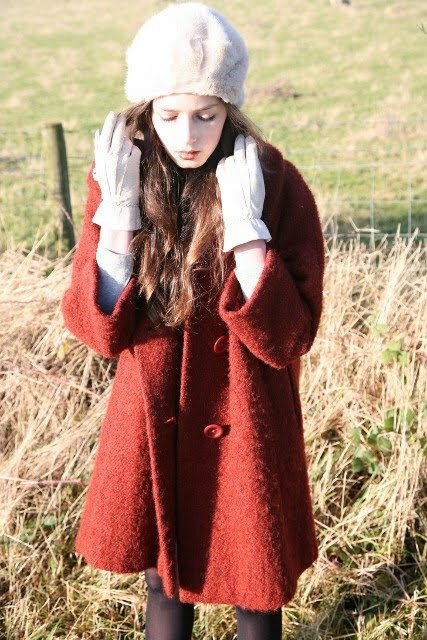 The rusty red coat is my 92 year old great-grandma's and is the last truly vintage item she had in her wardrobe. Just donated to me. I believe it was worn at my mother's christening. Again, very warm- the way coats used to be made to last (though the sleeves are far too short for me). The shoes are from a charity shop. Unfortunately, they look fantastic but are the most uncomfortable things to walk in ever! Both pairs of gloves are family donated. (Another great-granny's, along with the brooch) The dress in both of them is from Beyond Retro. I've just re-discovered it for the second time as it was skulking in the back of my wardrobe for about 3 months. I'm now off to finish off my art project due in tomorrow (textiles of course! ), so good night! 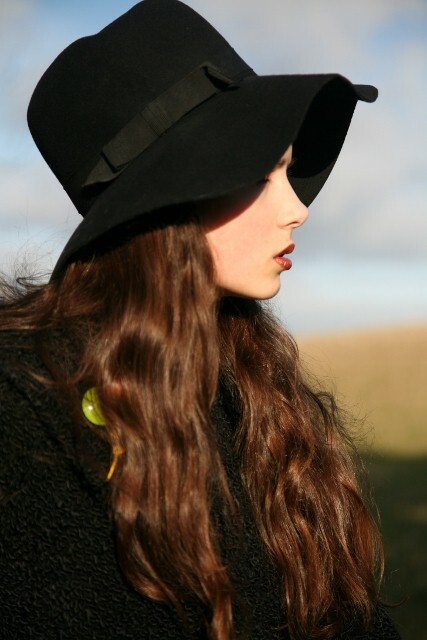 The floppy hat is amazingly gorgeous on you- made just for you! Love these pictures, so pretty and artistic! Nothing beats a vintage coat. So pretty. Love the black hat. I love both coats so much! That red one is a beautiful color! DUDE! that red jacket is so awesome!!!!!! :) Hope you are having an awesome Holiday! You style is so cool and you manage to model you clothes really well. When I started looking at these pictures I thought they were taken from an editorial in a magazine. They're beautiful! love love love that all black outfit. Oh, Roz, both looks are gorgeous, but I'm extra partial to the all black. 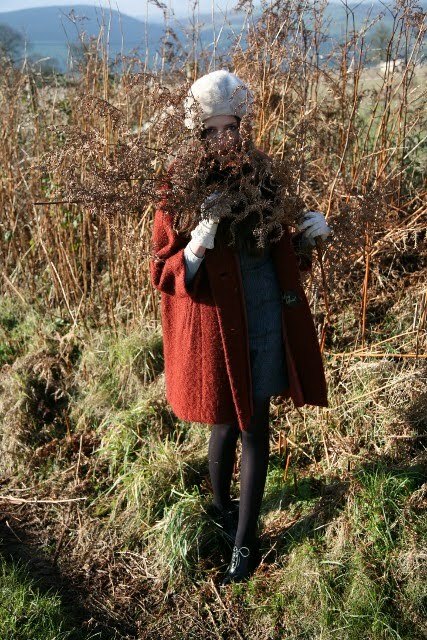 I've also got the chills because I was just thinking the other day (possibly at the same time you were shooting this) at what point did I give away my lovely step grandmother Martha's coats, and to where? She - well later, I - had that exact black coat, 3/4 length sleeves, the same shape.. and I was so regretting I ever gave it away, as it had lived in our childhood walk in closet that my dad had built, lined with cedar, which smelled so lovely & repelled moths. 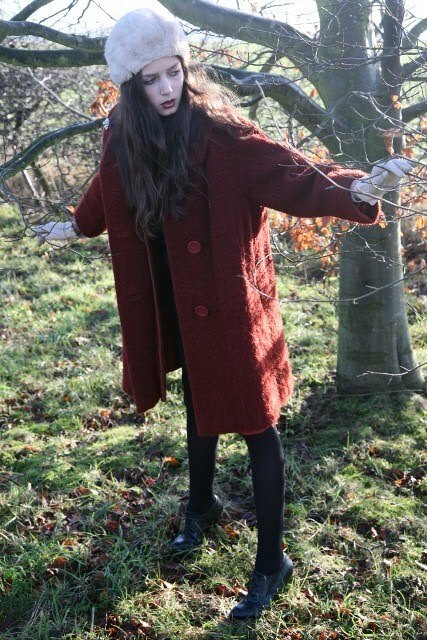 Then it had lived with me all those years in NYC.. wouldn't it be wild if somehow that coat ended up in a UK charity shop & you now have my deceased step grandmother's old coat?? hey my dear, ive been the same as u so busy recently! only just catching up on all our previous posts now! love the london calling post! :) love the black coat in the these pics! how do you always manage to look soooo adorable!!! you have a very chic style, i love it! Wow,what amazing coats I love them both and the hats are perfect with them. Great styling! That black hat is so pretty! These pictures are absolutely gorgeous! You're beautiful and have a very lovely sense of style. I'm following your blog now! You blow me away again with your outfits!! I love them all so much! Those 2 coats are just so perfect:) Reminds me of the 50s when the ladies will go for cocktail parties. Oh my gosh. Youre profile shot, the first picture, is simply stunning.